The Huh? : Old Sketchbook Pages: Project Homage: "The Kidd"
This is one of my favorite personally designed characters to this day. Outside of two others I made for this project, being called- 1) The Dammu-Yoggua and 2) The Sword of the Nine Tribes. There is a chance I'll post those pics in a few weeks. But for now I'm just doing small pieces on the few sketches I found tonight- and I'll dig out the rest another time. Anyhow, this character is of an alien race that I can only describe as "living flutes." Their entire communication is through complex musical systems of notes. The skulls would, I figure it, work like a combination of a flute and a lambeosaurine (a hollow-crested hadrosaur). Air would be forced through complex tubing, and the muscles around the holes on the elongated head to make all the various notes by contracting and closing off pathways- like fingers on a flute. I figure there would also be other airways for breathing so they could both "sing" and breath at the same time. Due to the character being from part of Project Homage, people might be able to guess what show I wanted to update and make it into a hard sci-fi series. Which is why it looks to be in a containment suit of sorts- to mask it's natural appearance from most humans, which would not know of these odd creatures. Since they would be much smaller than humans, an exoskeleton and a lot of internal equipment would allow it to be on the team with only a couple people actually knowing what it was. 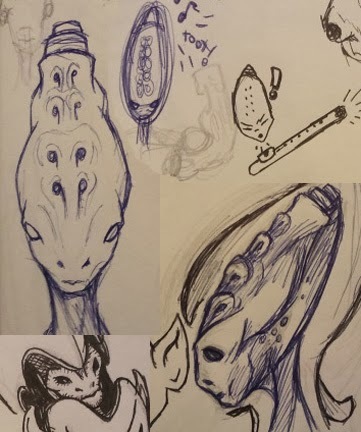 I'm actually really glad I saved these old sketches and notes, because I've got tons of better ideas to use these for in my own stories now.